Discover country living in beautiful Patrick County Virginia. Patrick County's 467-square-mile area was carved from neighboring Henry County in 1791. 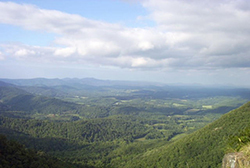 One-third is in the rolling Piedmont plateau and the remaining two-thirds in the rugged Blue Ridge Mountains where the Blue Ridge Parkway straddles the line with Floyd and Carroll counties to the north and west. Low taxes and cost of living make Patrick County a favorite spot for relocating or retiring. Patrick County’s rolling piedmont area make it a natural for vineyards, orchards and picturesque farms. Wildlife abounds including bear, deer and turkey. Patrick County is the starting point for the Dan, Smith and Mayo Rivers that wind through the County and provide an abundant source of fresh water. Recreational opportunities are many, boating, fishing and camping at Philpott Lake; canoeing and tubing on the Smith and Dan Rivers., to art displays, live theater and learning opportunities at the R. J. Reynolds Homestead and the Star Theatre. 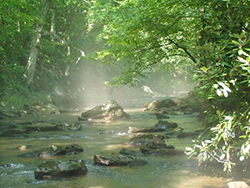 Rainbow trout abound in the cool mountain streams and horse trails await you, along with a beautiful sandy beach at Fairystone State Park. Guests to the county can stay at various bed and breakfasts, cabins, campgrounds and the luxurious Primland Resort. We also have two motels available. Historic attractions include the Patrick County Historical Museum, our classic antebellum courthouse which presides over the Town of Stuart and is registered as a National Historic Landmark, the Reynolds Homestead and Jacks Creek and Bob White Covered Bridges. Stuart, the county seat, was established 1792 as Taylorville, later named Stuart in honor of General J.E.B. Stuart, Confederate Calvary, a native of Patrick County. His birthplace Laurel Hill is located near Ararat in the western part of the county and hosts an annual civil war reenactment. Elevation 900 to 3,300 Feet, mostly 1,200 to 3,300 Feet.